Hung, Sheehan, Chen and Liu evaluated the paper, finding a few minor discrepancies between their own results on those of the published research. So overall a large variety of findings drawn from the critical replication project, and each of which individually greatly enhance the published research. Many of the peer reviews focused on a specific assumption that the Pitt and Hill article made about how sets of numbers are distributed. We talked to Dr. Helene Hill for comment. She noted that Dr. Pitt was working on the distribution issue noted by many reviewers, and that she was happy to see her research received such critical attention. just what I was hoping for — for our paper to be a model for posting and analyzing data. Get students their first scientific publication. For another step of Open Science brilliance, the reviews themselves sought to be completely reproducible, with the code for all the students’ calculations is available on GitHub (eg here and here)! 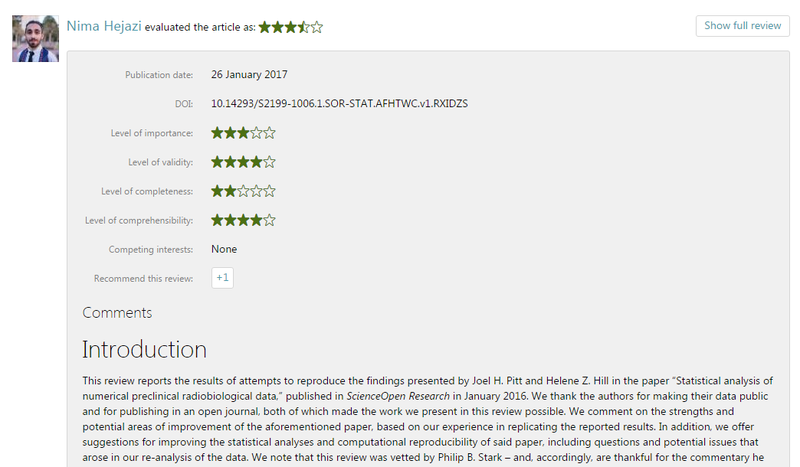 I think it’s remarkable that ScienceOpen extended the platform and your process to make this possible, including allowing people with fewer than 5 publications associated with their ORCID to submit reviews, figuring out how to allow figures in reviews, and that you are working on allowing reviews with multiple authors. ScienceOpen was really a partner in making this exercise possible. We also asked some of the students how they found the peer review exercise, many of whom praised Pitt and Hill’s efforts on making the research as reproducible as possible. Prof. Stark’s profile on our platform. Those stats are looking great! So we definitely count this as a major success story on several levels. Students gained the experience in performing analyses for the sake of reproducible research. Students also gained the skills and confidence to perform rigorous and constructive peer reviews in public. Post-publication peer review works just as well, if not better, than traditional peer review. Openness facilitates recognition and reward for peer review, which is crucial for those just starting their research careers. This whole exercise shows that just because research has been published, it does not mean that critical evaluation of it should stop. So, what is the next step? Well, anyone who has an ORCID can peer review any of 28 million research articles on our platform. They don’t have to be detailed statistical analyses – they can be critical commentaries, additional notes and context, or what your own related research says. The point is the choice is yours. The reason is that you help to improve the context and progress of your research field in the open, while improving your research skills and receiving recognition and credit for doing so.